Two kilometers from the village of Campagnac-lès-Quercy, perched on top of a mountain, is where this detached house is situated, in a lovely, tranquil environment. 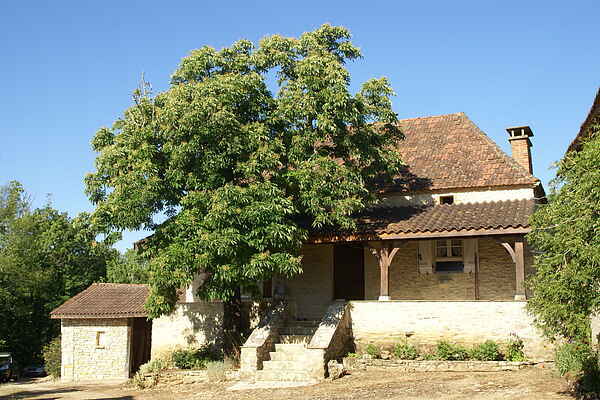 In the area between the Dordogne and the Lot river you can enjoy a wonderful vacation in the lush nature. The farm house (nineteenth century) has a lovely garden, an enclosed well as decoration, and a great variety of trees, plants and flowers. The children will have fun here with the slide, sandbox and playground equipment. The necessary refresment can be found not far from the house. In Cazals (10 km) you find a nice lake where you can swim or paddle boat. Near Gourdon (20 km) you find a lake where water sport enthusiasts can sail and surf. Apart from sports, the region exudes culture. Besse (9 km) has a beautiful church built in the twelfth century. The bastide Villefranche-du-Périgord (16 km) has a medieval market hall, which is still used. An experience is a visit to the caves at Les Eyzies-de-Tayac-Sireuil (Grotte du Grand Roc (caves), 45 km and Grotte de Font de Gaume, 50 km). A wonderful day excursion to Cahors (43 km) where you can admire the Valentré bridge (and more).